DESCRIPTION: In all times and in all cultures people have created myths to explain the unexplainable in the world, and for this contest I decided to do research into real animals that were most likely the source behind myths about fantastical creatures. Though it is necessary to present only one illustration for the competition itself, in time I hope to draw the whole series. The composition and technique I employed are not usually used in scientific illustrations but I wanted them to reflect on the fantastical aspects of the animal. The subject I chose is the giant oarfish - a species of the family Regalecidae. It is the world's longest bony fish. It is silver in colour with dark markings, and the fins are red. It is nicknamed "the king of herrings". 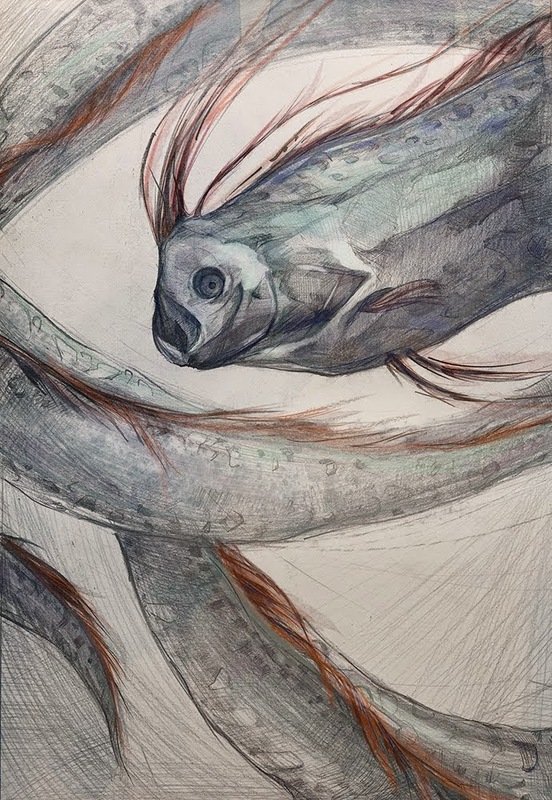 The giant oarfish has a specific mode of swimming and that, in couple with its size, is what led to the mistaken "sea serpent" sightings. It was first described in 1772 but still, little is known about the oarfish's behaviour.